A few months ago Total SEO Services received a sales call from Virgin Media Business offering us a better service at our new office than our current line with Zen Internet, for less money. We were initially sceptical as we had been receiving such a great service from Zen Internet, but they were already running the line into our second site and having both locations serviced by the same provider can mean a complete loss of service at both sites if there is a catastrophic failure with them. We pushed the sales guy hard and pointed out that we heavily rely on our connection and would need to run, among others, crucial services such as a range of static IP addresses, persistent IPsec VPN tunnel to our other site and a Mail Server & Web Server. We were assured that by paying for the enhanced SLA on the fastest line Virgin Media Business could supply, we could expect to receive a stable connection with lots of spare bandwidth, a reliable modem that would not need us to retire our own trusty firewall based on Pfsense (https://www.pfsense.org/), UK Support if we had any issues whatsoever and no traffic shaping or bottlenecks at busy periods. In other words, we were pretty much guaranteed to be happy with the product so we signed on the line and eagerly waited for the installation. The line was installed with a friendly service from the two engineers who came to do the installation, we had the obligatory speedtest.net demo on his laptop plugged straight into the new modem showing a solid 220Mbps down and 20Mbps up and he was on his way. We had a router password and our IP range scribbled on the cardboard box of the modem. Strangely enough though, no manual for the modem, no information regarding our Virgin Media Business username or password that had been pre-configured and no information as to how to configure our firewall to utilise our static IP addresses. No problem though. Although our previous experience of having two separate lines from Zen was different, where, by the time the engineer turned up we had received a full run down of the configuration options, our IP range, which IPs were usable and our connection credentials, We knew we had paid for the enhanced SLA and could expect great support. Sadly, this was not the case. On getting through to the support team, albeit based in the UK as promised, the response was clear – “We don’t support customer hardware, we will not be providing any information as to how to configure your firewall / router to use your range of IPs“. Frustrating, but manageable. With a lot of trial and error and testing which of our IPs we were able to assign to our router, we were eventually up and running. Now to get the IPsec VPN tunnel up and running. This proved impossible, the tunnel was established and stable but packets were fragmented and the firewalls on both sides were filling with errors. No traffic could pass through the tunnel. Back to the highly qualified support advisers to see if they could help shed some light on the problem – No such luck. The response was the same as before – “We don’t support customer hardware, we will not be providing any information as to how to fix your tunnel as it is clearly an issue with your firewall”. The line was ‘tested’, everything was normal and it was up to us to fix our gear. The next week was difficult to say the least, even though we were using the same hardware, with no configuration changes, our tunnel was not functional and crucial services that needed to sync over the VPN were not working. We had further issues appearing by now with high latency and connections to remote servers not over the VPN randomly dropping out. 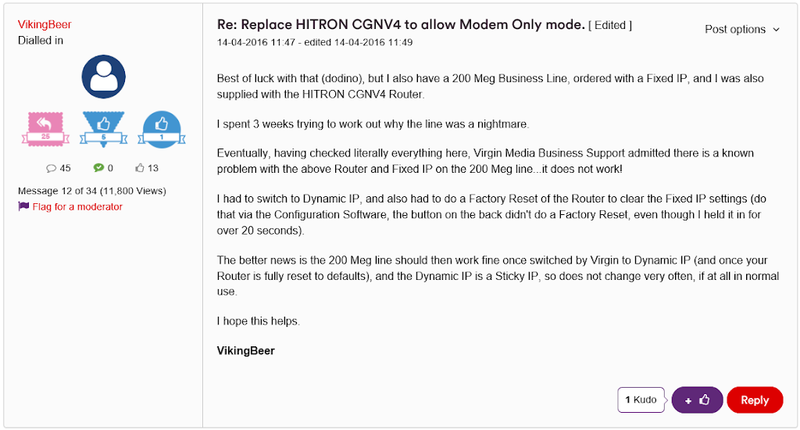 Eventually, we decided to check the logs on the Hitron CGNV4 modem that Virgin Media Business had installed. After finding lots of errors in the logs, we reverted back to the Virgin fault line. The news was good, they were aware of a fault with our modem when used with static IP addresses that was the likely cause of our connection issues. The office breathed a sigh of relief, we just needed to wait for Virgin Media Business to fix the bug and we would be up and running. Not so. When the technician was pushed for an estimated time to fix it, he didn’t have one. When asked how long the problem had been known about, he refused to answer. This was a serious issue for us as we couldn’t be sure as to whether the timeline matched up with the problem with our VPN or whether we needed to recheck, again, our own hardware. “Has it been present for days?” “Yes.”. “Has it been present all week?”. “…Yes”. Big pause. “Was this problem known about when we ordered our service?!”. “…….Yes”. Virgin Media Business customers do not receive the same 14 day cooling off period that residential customers receive. In fact, there is no option to cancel as soon as the line is installed. We fortunately had the direct dial number of the original sales guy who, to his credit, admitted we were not receiving what we had been promised and should be able to cancel. On a phone call that lasted an hour, we were put through to no less than 5 different advisers as each one refused to allow us to leave without paying their cancellation charge. When we eventually got through to someone based 3 miles down the road from us in Virgin’s Sheffield office, after being passed backwards and forwards to the Philippines twice, if it hadn’t been for the threat of such a large cancellation charge (over £1,000), the situation would have been almost comical. Virgin Media Business finally accepted that they had let us down and agreed to terminate the line at the end of the month with no installation or usage charge. Although our business is crawling along with staff working from home, frequent unnecessary journeys to and from our second site. What is most frustrating is Virgin Media Business‘ refusal to acknowledge this problem, especially to businesses that stipulate how much they are planning to rely on the service. We have been informed that we could fix the latency and fragmentation issues by reverting to a static IP address but this would render our line useless. When pushed and depending who you speak to, customer services will tell you that the problem only affects between 1% and 6% of customers with a static IP address, interestingly enough though they admit a replacement modem will not solve the problem because the problem is on all modems – so it seems an impossibility that such a small number of customers are affected. Virgin are not informing new or existing customers of the potential problem with static IP configurations unless you really push them on it. A quick Google Search can reveal several instances on Virgin Media’s own forum that this problem has been present for well over a year! Fortunately, we have experienced technicians here who have been able to prove to Virgin Media Business that there are problems on their lines. Before this, the wall was put up and we were on our own. We are also a small enough team to be able to relocate people and keep the business running. Others may not find it so easy. As a testament to Zen Internet, when we went back to them, cap-in-hand to say we needed a replacement line as quick as possible, the adviser we spoke to first offered to help us trouble shoot the problems we had with Virgin! Virgin Media Business‘ competitor was more inclined to help us fix their problem than they were. We politely declined the offer as he had just proved why we should never have left them in the first place. The Zen Internet line can’t get up and running fast enough. In the meantime, more and more Virgin customers are being sold expensive Broadband lines with equipment that Virgin know full well is faulty. Hopefully this will stop a few potential customers of making the same mistake we made. If you are in need of web or email hosting services, feel free to contact Total SEO Services. We offer a wide variety of hosting services, which all come with decent uptimes and warranties.